While interior designer Dorothy Draper is most well-known for baroque interiors featuring hallmarks of large floral patterns, plants, and vibrant colors, she adapted her vision to a range of spaces, including automobile and airplane interiors. This 1957 design for an airplane club area still evokes elements of the Draper fantasy but in a style more suited to an industrial, commercial space. Bold red chevrons on the seat upholstery add whimsy, while the shell forms of the white chairs echo the types of furniture that appeared in offices and waiting rooms throughout this period. As architects increasingly designed interiors and often embraced minimalism as the standard style for commercial spaces, Draper’s design indicates her versatility as a designer in a changing market. At six feet tall, Draper famously valued comfortable spaces, and this design also demonstrates how a commodious and roomy interior could be created even within the small confines of an airplane. The Convair 880 was the first jet airplane to challenge the supremacy of Boeing’s 707 model in the airline industry. When General Dynamics hired the firm of Dorothy Draper & Co., Inc. to design the plane’s interiors, they were undoubtedly hoping to use style to appeal to 1950s jet-setters in order to compete with Boeing. 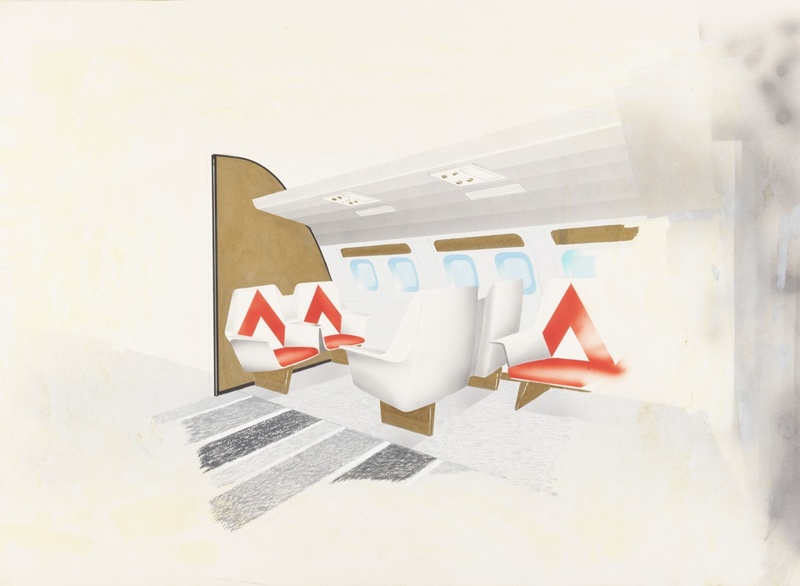 Draper and Co., Inc.’s design for the Convair 880 lavatory continues the sleek design of the club area, echoing the vibrant red in a plastic-laminate veneered interior that functioned efficiently and comfortably for consumer use. Both of these drawings served as models for the mock-up plane interior assembled in San Diego prior to fabrication of the production airplane. TWA soon purchased Convair and continued to use the Convair 880s with Dorothy Draper & Co., Inc. interiors. Only sixty-five 880s were produced over the lifetime of the production run from 1959 to 1962, and General Dynamics eventually withdrew from the airliner market. Julie Pastor is Cataloguer in the Department of Drawings, Prints & Graphic Design at Cooper Hewitt, Smithsonian Design Museum.